This is a great recycling craft, and you probably have all the supplies lying around the house – so why not sweeten your shoes with a shoe spoon sachet? Start by tracing a circle around the saucer on your choice of material and cut this out. Hot glue ruffled lace around the front edge of the fabric circle. Pinch this in a little as you go, so the lace will sit properly. 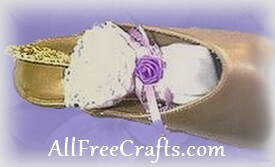 You can, of course, sew these by hand or machine, but hot gluing is quick and easy to do and works very well. Now, gather up the edges of the fabric circle. Fill the spoon with potpourri and slip the spoon inside the center of the fabric. Hold the sachet together at the neck of the spoon and wrap the rubber band around, close to the lace. Tie a ribbon around the rubber band to cover it up. Tie a ribbon bow. Glue on some ribbon roses or silks. This recycling craft is very fast and easy to make – and you probably have all of the supplies already. Enjoy!